Apart from the new ‘X60’ identification on the bonnet, round headlamps and a new bright finish for the cab-mounted work lights, the latest addition to the McCormick range gives few clues to the extensive changes made beneath the bodywork. An integral front three-point linkage and pto is optional on all models in the X60 Series, as well as ‘750’ rear pto for economy 540rpm plus 1000rpm shaft speeds. Yet with more engine power, increased linkage lift capacity and a new transmission, the X60 Series brings new levels of performance and features to the McCormick mid-range. Four Perkins-powered models replace the three-model CX line with engine outputs spanning a wider power range. The 92hp X60.20 comes first followed by the 101hp X60.30, which matches the most powerful model in the CX range, then the line-up moves on to the X60.40 with 110hp output. At the top of the range, the McCormick X60.50 has a modest step-up in power for draft work at 112hp – but it has a more significant 11hp advantage for pto-driven implements and road transport with 121hp output. On all four versions of the X60, greater fuel capacity from the 180-litre tank allows longer working hours between refills. Power and torque is channelled through a new power shuttle transmission. It has the three powershift steps as on the superseded design but 12 more forward speeds for added versatility. In total, there are 36 speeds forward – or 48 when the optional creep ‘box is added – and 12 or 16 speeds in reverse. The powershift steps are still selected by the familiar thumb switch on the range lever, where there is also a button that saves using the clutch pedal for shifting from one range to the next. The operator can also use a new modulation control to fine-tune the responsiveness of the clutch and power shuttle to suit different circumstances and personal preference. Using a heavier-duty front drive axle built by ARGO Tractors introduces a locking differential and an integral all-wheel braking system for the first time. In addition to the larger number of oil-immersed discs installed in the rear axle, this significantly improves the braking potential of the tractor, while the standard booster on all models eases the pressure required at the pedal. An increase in three-point linkage lift capacity to 5000kg and the use of lower link rather than top link draft sensing also helps the X60 handle bigger implements better than its predecessor. Also, operators can fit a greater number of remote valve couplings – up to five instead of three – to cater for greater use of hydraulic adjustments and features on modern implements. A further advance is the option of three-speed power take-off, which adds a ‘750’ speed between the regular 540 and 1000rpm settings. This can be used to obtain 540rpm at the shaft using a lower, more economical engine speed. 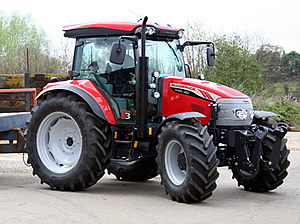 Prices for the new McCormick series start at £40,282 for the 92hp X60.20 rising to £46,555 for the 112/121hp X60.50 version.